An eatery with a name like R.N.S.Q. (pronounced “erunesque” in Japanese) which claims to be neither a bistro nor a restaurant but a “bistaurant,” might sound too puzzling for the average diner to want to check out. Does it serve French cuisine or some unfathomable new style of fare? And what kind of atmosphere could you expect in a place that is, presumably, more formal than a bistro yet more casual than a restaurant? 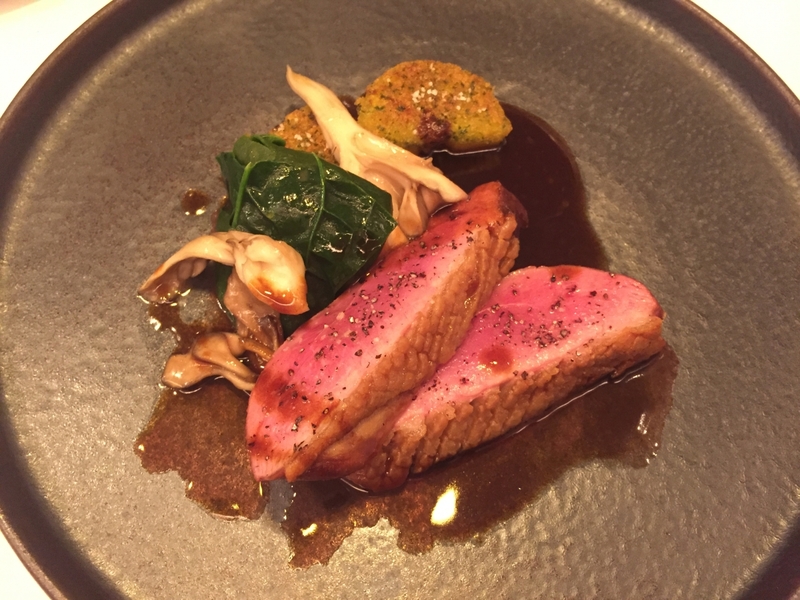 But don’t let such minor matters discourage a visit to this culinary gem tucked away in a secluded alley in Azabu Juban. 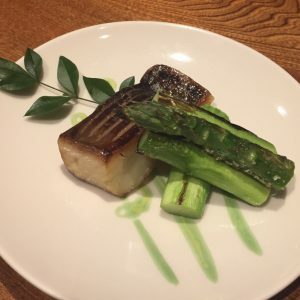 The cuisine here is, indeed, hard to define, fusing French and Japanese techniques and ingredients with original ideas emanating from the creative mind of the young chef, Kazuya Iguchi. The interior is stylishly decorated in subdued tones with dark brown and cream-colored chairs and white tablecloths. What is clear, though, is that the restrained, though cozy, atmosphere puts R.N.S.Q. in the category of restaurants and the food is, without a doubt, much more sophisticated than anything you might hope to find in a bistro. We visited on a bitterly cold winter day and were met by the maitre d’ who greeted us rather formally – another sign that R.N.S.Q. does not quite fit into the category of a neighborhood bistro. Thankfully, he warmed up to us over the course of our meal, even seeking our advice on the difficulties of pilates moves and making our lunch a comfortable and friendly experience. Being (or pretending to be) modest eaters, everyone in our group of four women from various corners of the world opted for the smallest and cheapest Y2,500 lunch course. 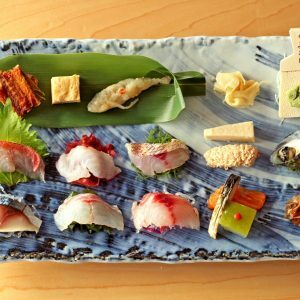 This is an omakase course, meaning you get whatever the house is offering that day. On this occasion, the main dish happened to be pork but as some of us preferred not to eat pork, we were offered duck as the main dish, at an additional cost of Y500. From the start, we were impressed by the dishes lined up in front of us, nearly all more refined than anything we could have expected in most Y2,500 lunch courses. 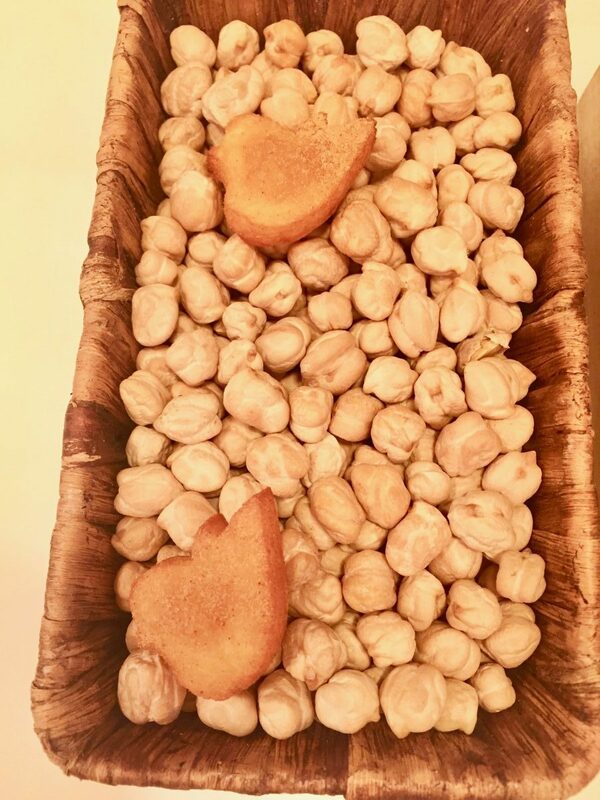 The first appetizer came as a playful display of three different snack-like morsels – deep-fried tapioca crackers topped with rapeseed leaves and yuzu (an aromatic citrus fruit), mussel mousse rolled into thin crackers topped with black garlic paste and dill, and chickpea fritters in the shape of a chick. The chickpea fritters were deliciously crisp on the outside and soft on the inside but were the least unsurprising of the three. Chickpea fritters resting on a bed of …what else?…chickpeas. The tapioca crackers were a delightful and unusual combination of ingredients, but most surprising was the mussel mousse, which had none of the chewiness of mussels but was creamy and flavorful. 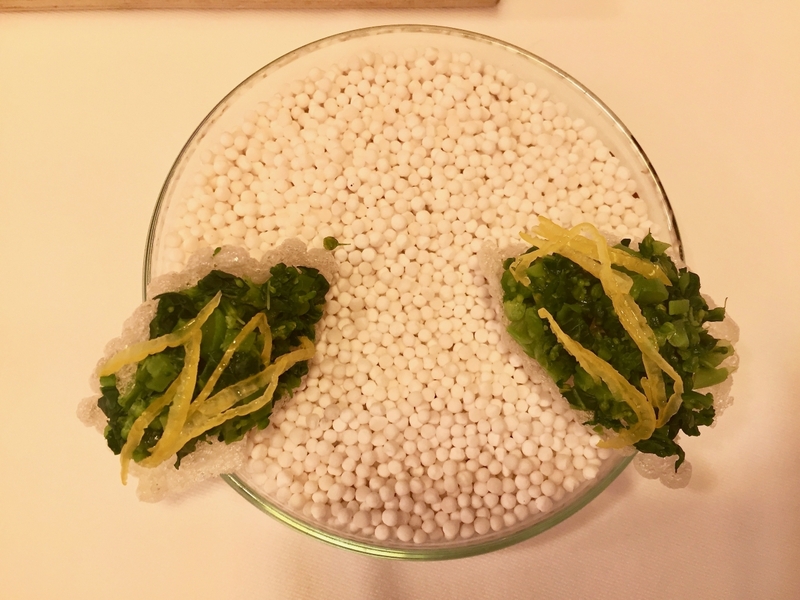 Crisply fried tapioca married with aromatic rapeseed leaves and yuzu. 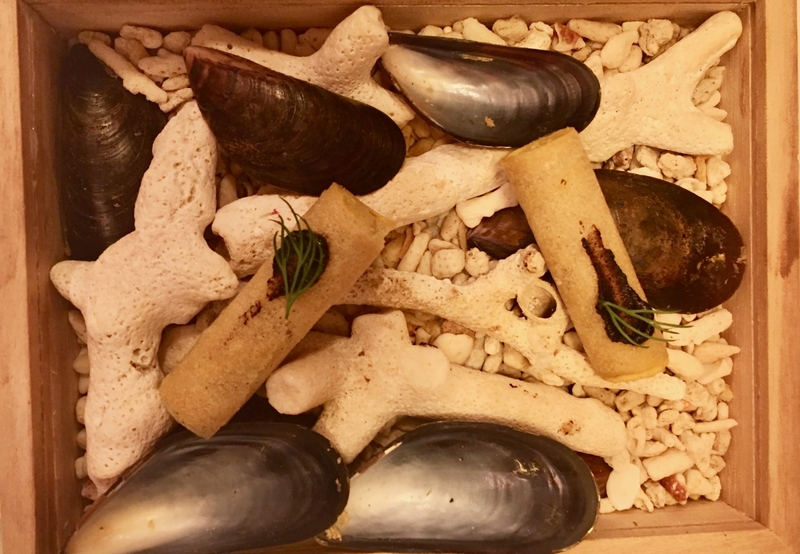 This presentation of mussel mousse, as if accidentally discovered on the beach, belies the hard work that must have gone into making it. 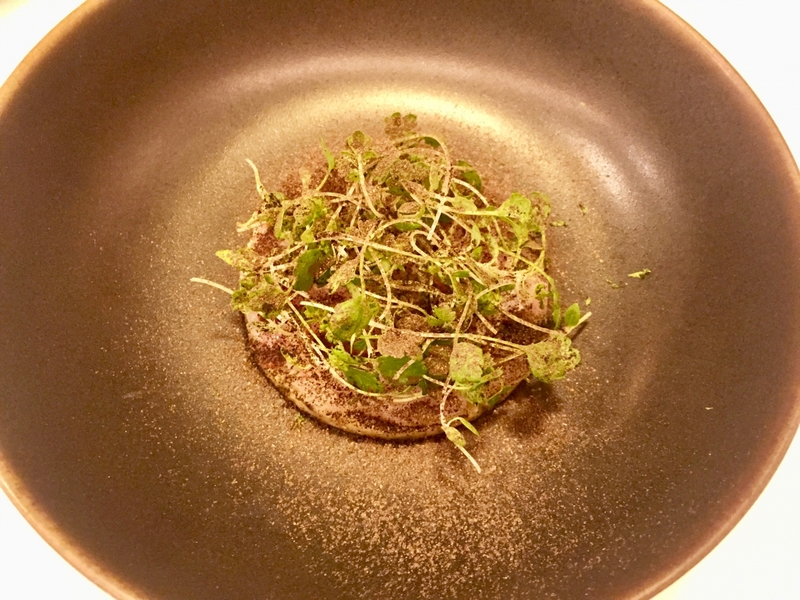 Our next appetizer was a carpaccio of winter yellowtail, or kanburi, with sudachi (another aromatic Japanese citrus fruit) topped with sprouts of myoga (a Japanese relative of ginger) and a powder made from the grilled and dried skin of eggplant. This intriguing dish was both as beautiful and delicious as anything served in much more high-brow establishments. Who ever heard of grilled eggplant skin made into a powder? I couldn’t imagine how early in the day the chef had to start work to prepare such complex dishes by lunchtime. Next came a beautifully arranged salad of 20 different vegetables with a chicken-and-butter sauce topped with shavings of semi-hard cheese from Hokkaido. The salad may look to be of modest size but there are 20 vegetables in there. The buttery flavor was not at all overwhelming but gave this salad a warmth that made it absolutely delicious. My main dish was a choice cut of duck garnished with black pepper, which was tender, with just the right balance of piquant flavors. The maitre d’ explained that only the middle section of the duck meat had been used for the dish. The duck and its accompaniments were delicious although the side of fried potato cakes was rather salty for my taste. 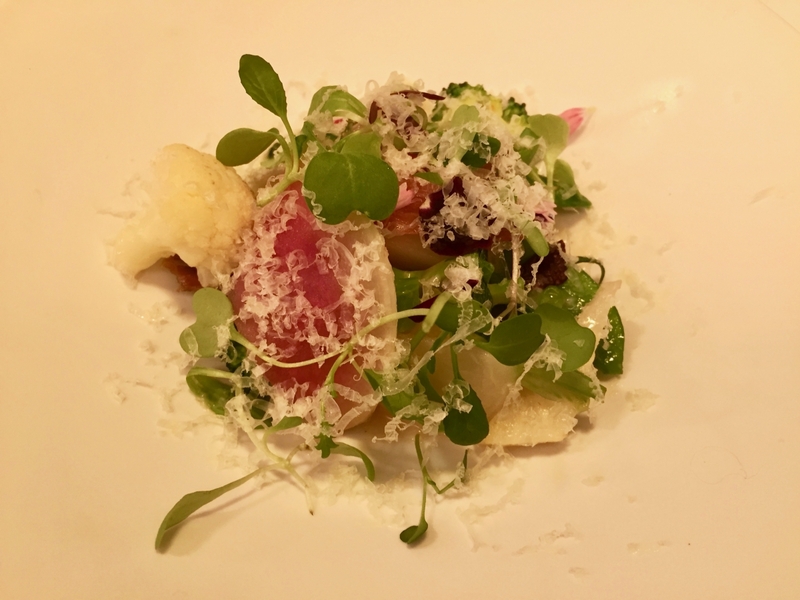 However, if there was still any doubt, the main dish was a clear sign that the chef had acquired the foundations of his cooking at very high quality French establishments. Two beautiful slices of duck featured in a very French main dish. 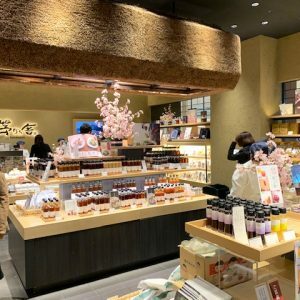 So, we were not surprised to learn that the youthful chef Iguchi, who is still in his twenties, according to the restaurant’s website, trained mainly in Japan with, among others, Tateru Yoshino, Alain Ducasse and Michel Bras, who has an establishment in Toya, Hokkaido. R.N.S.Q. is proud of its wine selection, which is restricted to wines from Bourgogne, Champagne and the Rhone. The owner’s love of Bourgogne is also reflected in his choice of the name R.N.S.Q., which refers to the Route National Soixante-quatorze, which runs through Bourgogne. Although I am more of a Bordeaux fan, I cannot wait to return to this “bistaurant” and discover the joys of coupling some of their selected wines with Chef Iguchi’s delightful creations.